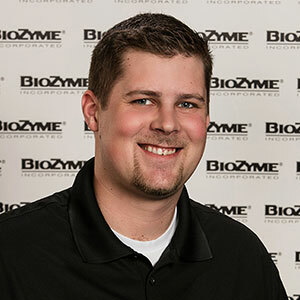 Jake Warntjes, Hennessey, Okla., has been promoted to the role of National Sales Director at BioZyme® Inc. He is one of three sales directors leading the team of Area Sales Directors spread across the United States. “Since the first day on the job at BioZyme, Jake has not only had the willingness to learn, but also exhibited the drive that it takes to lead a high performing sales team. Jake has always been respected by his team members and continually remained focused on our customers. I am very excited to have the opportunity to promote Jake into a leadership position and have no doubt that he will continue to raise the bar for our team,” said Alan Lee, Director of Domestic Business Development for BioZyme. In his new role, Warntjes will lead a team of ASMs, helping them grow the dealer network and cultivate relationships with current dealers. He will continue to represent his ASM territory of Western Kansas, Western Oklahoma and the Texas Panhandle. Warntjes joined BioZyme as an ASM in February 2017. He is a native of Oregon and attended Oklahoma State University where he earned his bachelor’s degree in Animal Science. He was a member of the 2012 National Champion Livestock Judging Team. Warntjes is passionate about the livestock industry and enjoys judging shows and helping young exhibitors succeed with their projects. He likes to assist his brother with his club lamb operation in California when time allows. BioZyme is known for its supplement brands VitaFerm®, Sure Champ®, Vita Charge®, DuraFerm® and Vitalize®. The company also manufactures and markets Amaferm®, the key additive in all its supplements. To see a listing of the sales staff, visit: http://biozymeinc.com/our-staff/.